Hello Friends, I am hosting this week at Just Us Girls and we are in full fledge wedding planning at our house, so the Photo I was inspired by this week, fits my mind set perfectly! I hope you enjoy it! Remember, you don’t have to make a Wedding card per say, however the photo inspires you is all you need to do! All the products you see here are from SU. This card was very tough to photograph because of the shimmery silver paper and the silver embossing powder, but what can you do! Please come on over and join my fellow teammates and I this week! Categories: Cards | Tags: Card making, Cards, heat embossing, love, rubber stamps, stamping, Stamping Up, wedding card | Permalink. Your card is so stunning and so very elegant. You used the inspiration photo to make a beautiful card for a wedding. I love it. Oh what fun you are having at your house! 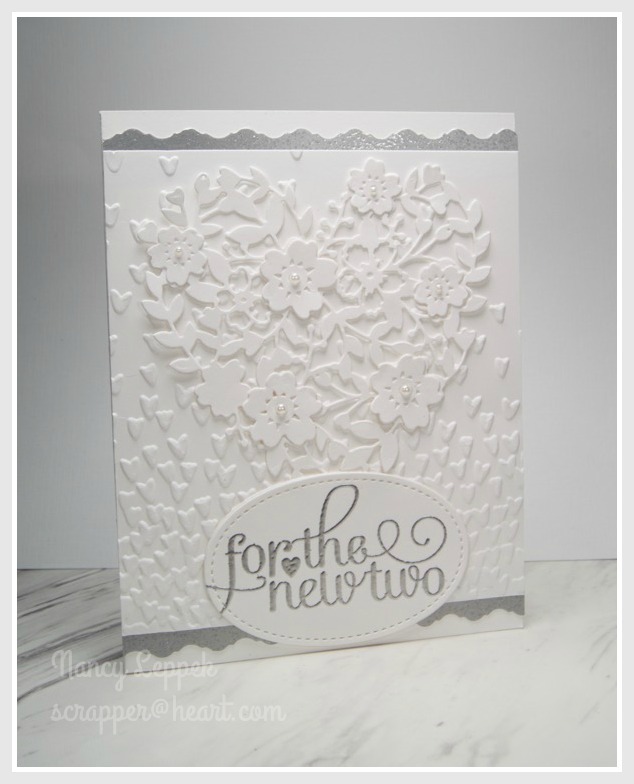 I can see that this beautiful card is the result of much planning and it came out gorgeous. I am sure that it shines and glitters and will make wonderful and loving gift when you present it. Beautiful and elegant. Love your card. Have fun with all the planning and all the details. Hugs my friend. Certainly is beautiful and oh so elegant. I bet you are having so much fun with the planning of ‘That Wedding’ . I know it will be totally awesome. Gorgeous photo Nancy. OMG… this is just awesome!!!! I love the big heart and the design, perfect colour combi! I would be very glad if you show your lovely creation on my challenge blog Do-Al(l) Kreatives! Oh yes, you are going to be in wedding mode for quite some time….SO! MUCH! FUN!!!!! Your card is gorgeous – I LOVE that SU die. I don’t own it and keep thinking I should. Also LOVE the challenge photo – stunning! This is so gorgeous and elegant, so perfect for a wedding card! I love that floral heart and the embossed hearts on the background. Beautiful design. 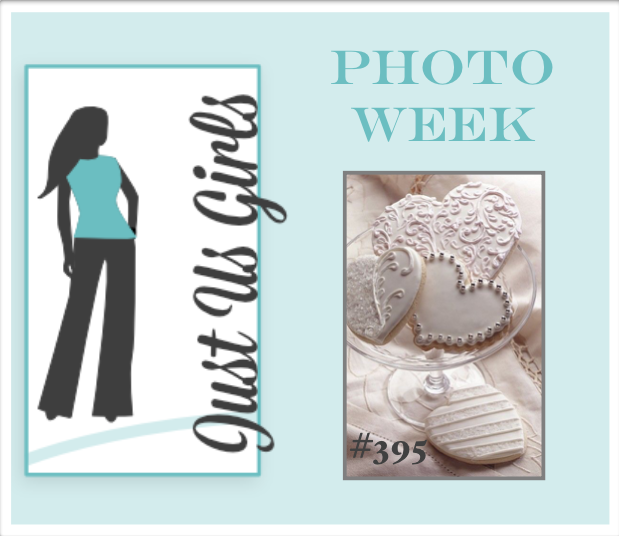 I love the photo you chose for our photo challenge this week! That heart is amazing! Love it. All the white with that silver shimmer works so wonderfully! Great job! Your heart die is gorgeous! I love it all in white and the hearts in the background were a perfect choice. Beautiful card! Eeeeek! this card is stunning!! I LOVE white on white! I will HAVE to try to play along.